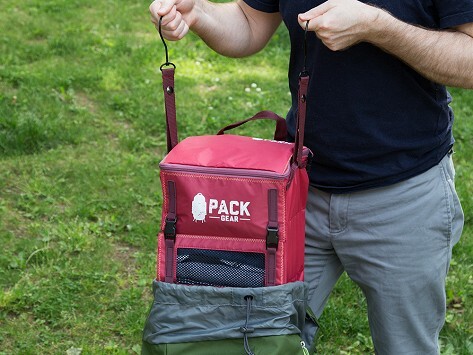 The PACK Gear travel organizer weighs less than a t-shirt, and built-in hooks let you hang it almost anywhere. Four closable compartments keep your stuff accessible and securely in place. Keep your backpack (or any bag) organized, whether you’re hiking across Europe or spending the weekend at a friend’s. Dimensions: Empty: 7" x 9" x 0.5"; Filled: 7" x 9" x 18"
This is my favorite packing accessory! Have purchased several more to give as gifts to my traveling friends! The pack gear is very handy for organizing a suitcase and having everything immediately ready; I would also add that its helpful for keeping everything in one place so nothing gets left behind, because it can be used as "shelves" so items don't get scattered. Sometimes the best way to travel is with a backpack. It’s compact and leaves your hands free, but it usually becomes a mess when you need to find anything. PACK Gear is a lightweight travel organizer that keeps your stuff organized and easy to access. Jonathan Teplitsky is an Army member and avid traveler. While backpacking in Europe with friends, they all had the same problem—their packs were always a disaster. And reorganizing took up too much of their travel time. So they came up with the PACK Gear insert. There are four compartments for clothes, toiletries, and other essentials. Three sections buckle closed with mesh fronts, so you can see everything inside. The top compartment zips, and built-in hangers let you put it almost anywhere. PACK Gear weighs less than nine ounces, and even though it’s designed for a backpack, it works for luggage and gym bags, too. Hike the Alps, couch surf, take a road trip . . . wherever you go, stay organized.